Fig. 1 Snapshot of reactive planar liquid jet. Fig. 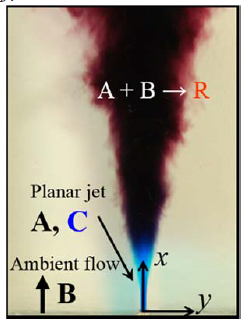 2 Schematic diagram of the turbulent/non-turbulent interface of a jet. Fig. 3 Conditional mean concentrations at x/d = 20. Fig. 4 Conditional mean chemical reaction rate. (1) Bisset, D. K., Hunt, J. C. R., and Rogers, M. M., The Turbulent/non-turbulent Interface Bounding a Far Wake, Journal of Fluid Mechanics, Vol. 451 (2002), pp. 383-410. 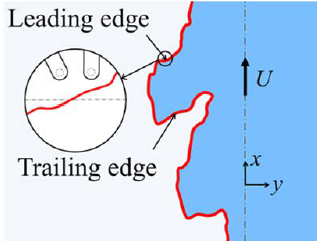 (2) Westerweel, J., Fukushima, C., Pedersen, J. M., and Hunt, J. C. R., Momentum and Scalar Transport at the Turbulent/non-turbulent Interface of a Jet, Journal of Fluid Mechanics, Vol. 631 (2009), pp. 199-230. (3) da Silva, C. B., dos Reis, R. J. N., and Pereira, J. C. F., The Intense Vorticity Structures near the Turbulent/non-turbulent Interface in a Jet, Journal of Fluid Mechanics, Vol. 685 (2011), pp. 165-190. (4) da Silva, C. B., dos Reis, and Taveira, R. R., The Thickness of the Turbulent/nonturbulent Interface is equal to the Radius of the Large Vorticity Structures near the Edge of the Shear Layer, Physics of Fluids, Vol.22 (2010), 121702. (5) Taveira, R. R., Diogo, J. S., Lopes, D. C., and da Silva, C. B., Lagrangian Statistics across the Turbulent-nonturbulent Interface in a Turbulent Plane Jet, Physical Review E, Vol.88, No. 1 (2013), 043001. (6) 酒井康彦, 中村育雄, 角田博之, 櫛田武広, 吸光スペクトル法によるファイバ型多成分変動濃度計の開発に関する研究, 日本機械学会論文集B編, Vol. 56, No. 522 (1990), pp. 518-522. (7) Bilger, R. W., Saetran, L. R., and Krishnamoorthy, L. V., Reaction in a Scalar Mixing Layer, Journal of Fluid Mechanics, Vol. 233, No. 1 (1991), pp. 211-242. (8) Antonia, R. A., Conditional Sampling in Turbulence Measurement, Annual Review of Fluid Mechanics, Vol. 13, No. 1 (1981), pp. 131-156.